A road trip is the perfect way to travel, especially if you feel like going on a getaway vacation. You just grab some food and water, fill up the tank, and hop in the car. Considering how cheap gas is these days, there is nothing stopping you from cranking up the music and hitting the open road. 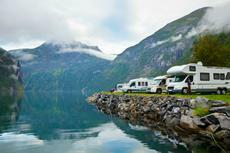 Take this adventure to the next level and travel in a motorhome. Why not extend the good times by a few more days or even weeks? RV camping means you can live in relative luxury almost anywhere. Give in to the lure of the open road; the kids will love the experience, too. RVIA’s RV Consumer Demographic Profile shows RV ownership has reached a new peak. Research reveals the number of households that own at least one recreational vehicle has grown to a new peak of 8.9 million, up from 7.9 million in 2005. About 8.5 percent of homes in the country now own RVs, up from 8 percent a decade ago. RV ownership is expected to continue growing as more people learn how this type of traveling is a cost-effective way to spend time having fun outdoors with family and friends. Be an intrepid wanderer and discover the country in an RV. Planning can be a lot of fun, considering how many sources you have – planning websites, apps, and other campers. It can also get overwhelming. That’s why – for your first trip – consider the basics.